Arbor Networks reports on Google’s network traffic. In their earnings call last week, Google announced a record 2010 third-quarter revenue of $7.29 billion (up 23% from last year). The market rejoiced and Google shares shot past $615 giving the company a market cap of more than $195 billion. This month, Google broke an equally impressive Internet traffic record — gaining more than 1% of all Internet traffic share since January. If Google were an ISP, as of this month it would rank as the second largest carrier on the planet. Only one global tier1 provider still carries more traffic than Google (and this ISP also provides a large portion of Google’s transit). In the graph below, I show a weighted average percentage of Internet traffic contributed by the search / mobile OS / video / cloud giant. As in earlier posts, the Google data comes from 110+ ISPs around the world participating in ATLAS. The multiple shaded colors represent different Google ASN and reflect ongoing global traffic engineering strategies. If you count caching they are even bigger. Google now represents an average 6.4% of all Internet traffic around the world. This number grows even larger (to as much as 8-12%) if I include estimates of traffic offloaded by the increasingly common Google Global Cache (GGC) deployments and error in our data due to the extremely high degree of Google edge peering with consumer networks. 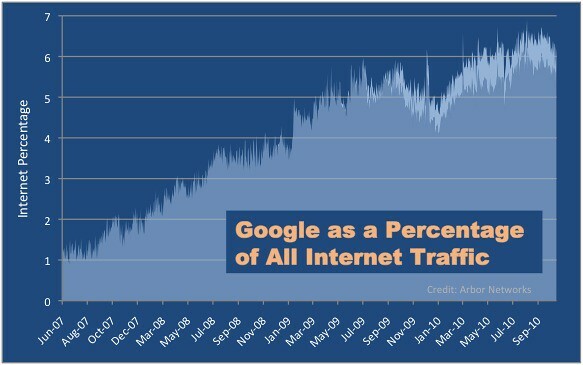 Google has more traffic, more data centers and servers than anyone else. How high can Google go?